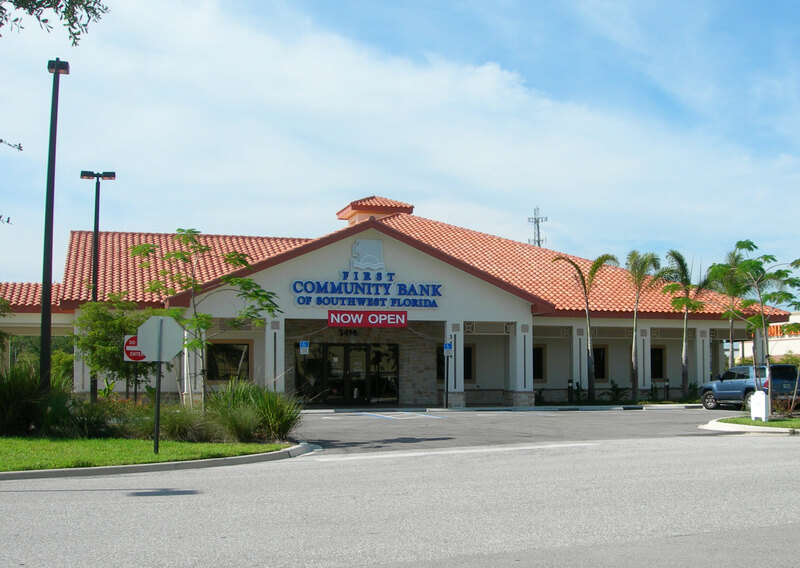 News Archives | Benchmark General Contractors, Inc.
FORT MYERS, FL (September 23, 2009) – When it comes to banks, usually the term “green” applies to money, but in the case of First Community Bank (www.fcb-yourbank.com) at the Forum Shops in Fort Myers, “green” is defined as environmentally responsible, sustainable building, inside and out. Completed last November 2008 by Fort Myers builders Benchmark General Contractors, Inc. (www.BenchmarkGenContractor.com), First Community is one of the first commercial buildings in the Fort Myers area to pursue LEED NC (New Construction) certification through the US Green Building Council. After a brainstorming session with the bank’s board, Benchmark’s president Mark Anderson, Benchmark project manager and LEED AP (Accredited Professional) Jeff Good, architect Dave Moore of Moore and Spence Architects PA and the bank’s senior vice president and director of information technology Jonathan Witenko reviewed the project and proceeded to implement every possible measure for environmental and sustainable responsibility. The building site was selected because of “walkability” – walking distance to area schools, supermarket, retail and restaurants. On the exterior, the roof is made of reflective tiles, a solar hot water heater is in operation, and landscaping consists of only native Florida plants selected for low water consumption. A reduced number of parking spots minimizes impact, and there are designated spots for hybrid and car pool vehicles. The bank’s entry has six feet of recycled, green backed carpet to prevent dust coming in from the outside which would endanger indoor air quality. Once inside, visitors will see recycled floor tiles, cypress, pine and birch wood used throughout, recycled ceiling tiles, window blinds and even recycled wallpaper. The bathrooms are equipped with waterless urinals, low-flush toilets, low flow sinks and specialized hand dryers with an 11-second burst of electricity, versus the usual 33-second versions. Walls are painted with 0-VOC paint and all sealants, adhesives, floor mortar and carpet glue meet the standards for environmentally protective products. Lighting is indirect or fluorescent to save electricity – plus the bank contracted with Florida Power & Light (FPL) to purchase green electric from sustainable sources. Specialized insulation in the concrete also makes temperature control more efficient. The emphasis on green and sustainable measures extends to furniture made of recycled fibers and to specially crafted bamboo-encased hybrid computers designed with 60 percent fewer parts to use less power. From the outset, construction trash was shipped to specific recycling areas and now recycling bins are placed inside and outside of the building. Employees use only environmentally protective soaps and cleaning solutions. The entire project increased overall costs by about seven percent, an investment supported by all involved to minimize the building’s footprint. 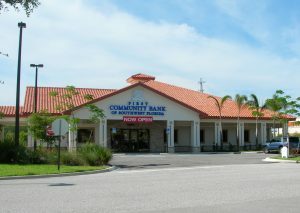 First Community Bank is located at 3414 Forum Boulevard in Fort Myers, Florida. Founded in 1984, Benchmark General Contractors is committed to projects that are sustainable and environmentally sensitive. The firm’s newest project is Sea Glass of Sanibel, a prototype sustainable community of 12 single-family homes in collaboration with the University of Florida’s Community Design Center. Benchmark has completed hundreds of commercial and residential properties, as well as restoration, renovation and remodeling projects. Their mission is to build upon their philosophy of exceptional service, creating quality buildings in a timely fashion. Benchmark serves Fort Myers, Naples, Sanibel and Captiva Islands, Cape Coral, Bonita Springs and all of Southwest Florida. SANIBEL ISLAND, FL (May 29, 2009) — A collaborative agreement between Fort Myers-based Benchmark General Contractors, the Florida Community Design Center (FLCDC) and the University of Florida School of Architecture is the first step in the planning of a sustainable residential cluster of approximately 12 single-family homes on a 12-acre property along Periwinkle Way on Sanibel Island. The property was previously the site of the Old Schoolhouse Theater and the home of the Sanibel Landscape Company, the first landscape nursery on the island. Design plans are underway. Charette Study photoThe mission is to create and optimize a sustainable, environmentally sensitive design that could become a model for future development of coastal communities in our region. FLCDC, a non-profit research and outreach mission of UF’s School of Architecture, will submit for review a series of schematic designs for a residential enclave that integrates coastal ecologies, social connectivity, permaculture and sustainability as core principles of the neighborhood planning and architectural design. Benchmark -partners Mark Anderson and Ron Rosen are donating an estimated five acres of the property to the Sanibel Captiva Conservation Foundation for the conservation and preservation of wetlands and protection of the Sanibel River corridor. Martin Gold, Director of Architecture at UF and the Executive Director of the FLCDC, explains that this project will engage in the best practices for low impact development and sustainable community design. Experts will be consulted regarding stormwater strategies, storm resistant designs, building materials and energy efficient design where site resources – breezes, rainwater, solar radiation and natural vegetative systems – are optimized through integrated design. Gold goes on to say that the clustering effect will result in a larger natural and undisturbed area that will host a rich variety of plant species and greater environmental opportunities for fish, turtles, butterflies, cattails and other wildlife. The higher number of plants will absorb hydrocarbons, thereby purifying stormwater runoff. Builders Anderson and Rosen say that many homeowners are shifting to the attitude that “less is more” and agree that energy efficient homes may be designed on a smaller scale. “Many homebuyers are ready for a simpler lifestyle,” says Anderson. “Floor plans from 2,000 to 3,500 square feet are ample for most families, easier to cool, energy saving and the way of the future. There is an emerging awareness of transitional self-sustaining communities with the potential to function off the grid. The existing vegetation on the 12 acres is remarkable as a result of being a plant nursery site years ago. Founded in 1984, Benchmark General Contractors has completed hundreds of new commercial and residential properties, as well as restoration, renovation and remodeling projects. Their mission is to build upon their philosophy of exceptional service, creating quality buildings in a timely fashion. Benchmark serves Fort Myers, Naples, Sanibel and Captiva Islands, Cape Coral, Bonita Springs and all of Southwest Florida.